20:1 Mango Mist 8 ml (100mg CBD: 5mg THC) Sub-lingual and fast acting. 8ml size - 60 sprays per bottle. 20:1 Mango Mist 8 ml (100mg CBD: 5mg THC) Sub-lingual and fast acting. 8ml size - 60 sprays per bottle. 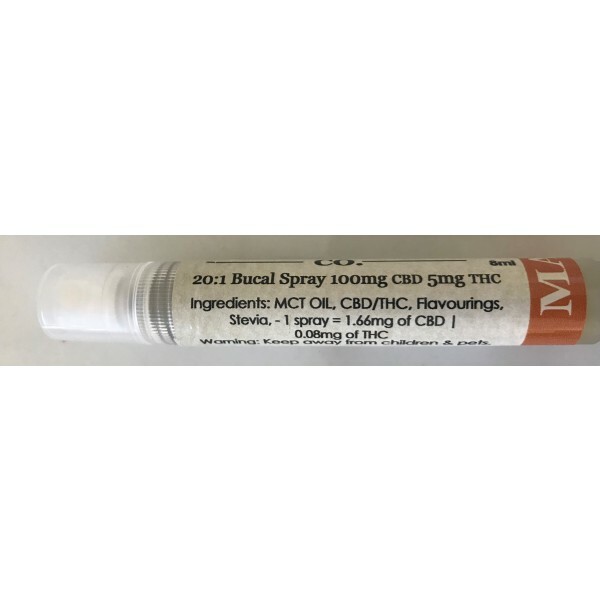 1 spray = 1.66mg CBD and ,06mg THC Fast-acting alternative for discrete use (looks like breath freshener) and tastes great. Convenient pocket/purse size. Effective relief from all forms of general inflammatory and neuropathic pain.